One of the key defensive measures when it comes to preventing pollution are spill kits, however it is equally important to have well trained first responders. By ensuring you have suitable spill containment measures and well trained staff you can ensure if a spill does occur its effects will be minimised. Often the health and safety/environmental managers are aware of how to use spill kits but they are rarely the first responders to a spill. By the time the alarm has been raised and they have gotten to the spill its severity has drastically increased. The case studies show examples of where an untrained workforce has led to a spill turning into an avoidable pollution incident. Ensuring operatives are aware of prioritisation when dealing with a Spill Situation to protect Personnel, Environment & Property (in order of precedence). How different materials (oils, chemicals, bodily fluids and foodstuffs e.g. milk) pose a risk to personnel and the environment. Understanding different types of drainage systems and how to protect them. Understanding the environmental sensitivity around the site e.g. Sites of Special Scientific Interest (SSSI’s). Health and safety aspects of spill response. Case studies looking at the health and safety, environmental and financial impacts spills can have. Highlight additional requirements following clean up i.e. waste disposal, restocking and documentation. A live spill demonstration using non-hazardous material. Outline your Spill Response Procedure and discuss in detail decision-making prior to commencing clean up. 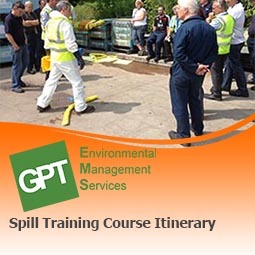 Our spill training is made bespoke to your needs and will be tailored to include information regarding your site specific risks and the control measures you have in place. We understand the difference between sessions designed for different sectors e.g. Distribution depots who’s main risks will be fuel spillages. Industrial sites which may use aggressive chemicals like caustic soda and hydrochloric acid. Food manufacturers who may have additional risks such as milk, beer and cream. For many industrial sites the main risk of pollution is provided by oils.Most commonly by bulk fuel storage on site or by vehicles bringing “foreign risks” on site.We can focus our training to ensure we cover the range of health and safety risks posed by oils, from exposure causing injuries to skin such as dermatitis and more severe health risks such as cancer* to oils posing other risks including fire hazards for flammable oils such as petrol. We will ensure the delegates are aware of how to deal with oil spills safely to protect the environment (1 litre of oil can contaminate a million litres of water). If your staff can deploy oil selective absorbents effectively on land and on water your chances of containing an oil spill will be much higher. For most sites the highest health and safety risks in the event of a spill are posed by chemicals, certain sites will hold corrosives such as hydrochloric acid or caustic soda but even sites with less severe chemicals will pose a substantial health and safety risk.Did you know that mixing a bleach and a degreaser can give off chlorine gas, a gas which can be lethal when inhaled.Our training will ensure the delegates are aware of the dangers chemical spills can pose and how to ensure they are adequately protected against them using PPE and RPE. As well as the substantial risks chemicals pose to health and safety our spill training will ensure the trainees are aware of the dangers chemicals pose the environment.1 litre of solvent can contaminated 100 million litres of drinking water and ammonia is toxic to fish at just 0.5 parts per million.We will train your staff to deploy chemical spill kits and use any other containment measures on site to reduce the chances of a spill causing injury and an environmental incident. Food transfer, packaging or manufacturing sites are an extremely high pollution risk.The damage posed by substances such as milk, cream, beer, fruit juice (especially concentrates) and glucose can be devastating to the environment.Naturally occurring bacteria break down foodstuffs entering a watercourse, using up oxygen in the water and leading to fish suffocating.It is therefore imperative that staff working on sites with pollution risks caused by organic spills understand the risks these substances pose and how to contain spills in a safe and effective manner. 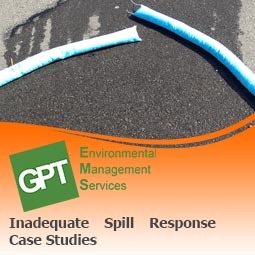 "I have no reservations whatsoever in recommending GPT Environmental to conduct all aspects of environmental management, including emergency spill response, training and risk assessment work." "Generation and implementation of effective emergency response and spill control procedures are fundamental aspects of a safety management system."